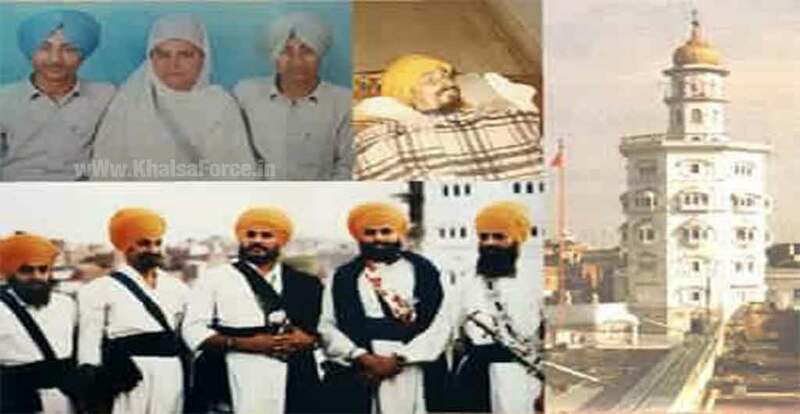 Home » Sikh Martyrs » About 1984 | Operation Blue Star » Operation Blue Star 1984 » Experiences From The Summer of 1984 – Part 1 | Shaheed of 1984 Ghallughaara. It was the last day in May of 1984 and every afternoon we would wait for the school bell to ring so we could go home and play outside in the hot weather. On this particular day, when we got home from school, we felt butterflies in our stomach as we saw Mata jee was hustling around packing clothes in a bag as if we were taking a trip. We all quickly swarmed Mata jee to ask what the packing was for and she paused for a moment to tell us that they would be going to a family wedding in home of “Khemkarn” Masi jee’s village. “Wedding! Oh yay!” proclaimed my elder brother. I also got excited and starting playing on the bed out of joy from this wonderful news. In those days, for us, just going to a family wedding was as exciting and fun as kids nowadays getting excited hearing of plans to go to Disneyland. Soon after our excitement settled, we watched Mata jee putting our clothes in the cloth bag to take along but my elder brother noticed something and blurted out, “We don’t want to wear these old clothes at the wedding, please get us a new set of clothes sewn for this fun occasion!” We got a stern response from Mata jee, “Where am I supposed to get you new clothes? We barely have food in the house for all us to eat, your Pitha jee has even sold off my wedding gold jewelry to buy a gun!” Mata jee’s complaint was truthful, even though she stopped wearing all ornaments after taking Amrit in 1974, we had kept the expensive jewelry around just in case of any hardships or troubles down the line. These sets of gold jewelry was sold off by my Pitha jee as soon as the Sangarsh picked up to have money for purchasing a 315 bore rifle. “If you want to come along, do so with these clothes, otherwise I will go alone!” Mata jee gave this firm retort at once. My daunting brother responded, “If we aren’t even getting new clothes, then what sort of wedding is this? !” I also took the same stubborn stance as my brother. In those days, only during a wedding we would usually get new clothes sewn. Only now I can understand as to why Mata jee gave such an unyielding response to our plea. That house which has no formal breadmaker around to provide, one can appreciate how difficultly the day to day expenses can be handled. After Sangarsh had started, living in city of Mohali, 3 kids to put through school, it was hard to get by for my mother. My Pitha jees Air Force job’s monthly pension was revoked. Our lands in Pind Dasuval near Amritsar were also taken over by the police in 1982 and no money was coming from there either. While responding to Nirankaari Dushts, my Chacha jee, Sukhdev Singh, went underground and we left our Pind Dasuval to move to Mohali. My Mata jee was always adamant that her 3 kids would go to a proper school in a big city compared to the village schools to get a better education. After the 1978 Saka and the attack on Chandigarh’s Secretariat, many Singhs would visit us in nearby Mohali. Bhai Anokh Singh jee and Bhai Sulakhan Singh jee would bring baskets full of fruit on their heads and we would get so happy seeing these gifts of fruit, the Singhs would also feel the same joy for us. Alas, these now seem to have been the last few days of delight in our home. Soon after, my 1978, my Pitha jee also went underground and the financial and social state of our home would decrease exponentially every day to come. I remember the weekly Akhand Keertanee Jatha programs would have extra langar and raw goods that Bhai Amarjeet Singh jee would drop off to our house, maybe they purposely bought extra foods every week for this reason only. With these leftovers, we would survive the week. Back to the wedding – Understanding these tough circumstances, we did not ask for much but sometimes in our adolescent age, we really became stubborn about not having to wear old worn-out clothes to the family wedding. Finally, my sister thought of a solution to make everyone happy. “Mata jee, let’s drop these two boys off at Shri Darbar Sahib Amritsar with Pitha jee and his Sathis and both of us will go to the nearby wedding ourselves.” Mata jee agreed to this so we quickly ate our roti, finished our homework, and ran out to play in the street. We were eager to see our Pitha jee and see Shri Darbar Sahib the next day, even more so than the family wedding. Hearing this, all the Singhs wrapped up the game and went for Ishnaan and preparation for Darshan at Shri Darbar Sahib. Seeing the beauty and radiance of all the Singhs once tyaar-bar-tyaar was a satisfying view. Kesri Dumaale, White Cholay, Blue or Black Kammar-Kasse, 3 ft. Kirpans in colorful Gatras, and rifles swung around their shoulders. Seeing all 40-45 Singhs behind Jathedar jee in Khalsa Bana while doing Parikarma felt like a glimpse to watching Singhs from times of Akali Phoola Singh jee’s NIhang Jathebandi doing Parikarma in the same manner. Bhai Kahan Singh jee was in the forefront always stopping visitors from taking photos because all these Singhs were meant to be underground at the time for doing Sodha of countless Dushts. After hearing Keertan and Rehras Sahib Paath from Darbar Sahib, all the Singhs returned. Once Langar was eaten, all us came back to the roof of Nanak Nivaas and layed out our bed spreads for the night. Bhai Gurmeet Singh aka Sulakhan Singh did Keertan Sohila Paath loudly and Singhs went right to sleep. Two Singhs were kept on Pehra as usual. In my heart, I had a strong desire to lay by my Pitha jee talk to him until falling asleep but Singhs had a rule to not speak at all once Keertan Sohila Paath was completed. The night fell, it was a short one. The next morning on the 1st of June 1984, the Singhs woke up by 2am. We also woke up but did not see Pitha jee anywhere around us. After asking around, we were told that Pithaa jee and Bhai Sulakhan Singh jee left around 11pm to get supplies from a Gupt location. In the meantime, Singhs were up doing Daatan and getting ready for Ishnaan. After Ishnaan, Singhs came back to Nanak Niwas and did Sangatee Nitnem. All the while, Bhai Anokh Singh Jee, Bhai Kahan Singh Jee, and Bhai Mehnga Singh Jee were at Darbar Sahib doing Ishnaan Seva. Bhai Sulakhan Singh Jee was out on a supplies run otherwise usually these 4 Singhs would always do the Ishnaan Seva at Darbar Sahib. June 1st started off to be a normal day, after listening to Asa Ki Vaar from Darbar Sahib, we had Garam Jal and Singhs laid down for a short rest. We were consumed with little mischievous games and were playing with the kids of Bhai Amarjeet Singh Daheroo as well. In the afternoon, we found a Carom-Board set to play with and starting the game. After a friendly quarrel while playing carom-board, all the game pieces were flying around the room in a mess. We started a new game shortly and the black game pieces would be flying off the board in full force in no time at all. Once, by mistake, a Singh knocked a white game piece off the carom-board and we started joking “One Singh has become Shaheed! One Singh has become Shaheed” full of laughter and innocence. “Hey kids, don’t talk nonsense like that!” we heard from nearby Bibis who were watching over us. Bhai Sulakhan Singh Jee’s wife Bibi Maninder Kaur Jee sweetly scolded us and we kept playing. Shortly after at around 2 PM, we heard the showers of bullets coming from the Army and BSF guns. Singhs were on guard and responded with our own guns with full force. Separate groups or Morchay were planned out to counter the attacks and Bhai Manmohan Singh Fauji suggested that only the groups who get shot upon should fire back and the remaining Morchay should stay on stand-by. Singhs used this strategy very well and the Army and BSF was not advancing at all. The morcha stationed at Gurdwara Baba Attal Jee started getting attacked after 3 PM. Bhai Mehnga Singh Jee was firing back fiercely. As the Army and BSF fire increased, Bhai Mehnga Singh jee went up Gurdwara Baba Attal jee level by level to respond with thunderstorms of bullets. The CRP forces drove their vehicles right up to the entry of the Gurdwara and we saw Bhai Mehnga Singh jee’s Kesri Dumala peek out from the roof’s edge to set his target. Instantaneously we heard TARR TARR from CRP guns and saw Bhai Mehnga Singh Jee’s head fall back. Many Singhs including myself were on the 4th level of the Nanak Niwas Saraa in Jathedar Bhai Sukhdev Singh’s room which had a window facing Gurdwara Baba Attal jee and saw all this in real time. Jathedar jee had been talking to Bhai Mehnga Singh jee with his Walkie-Talkie consistently till now. This was Bhai Mehnga Singh Jee’s last words that we heard, we did not hear another sound from his Walkie-Talkie after this. Hearing this, Bhai Anokh Singh jee looked upwards, closed his eyes and roared a loud Jakara for the First Shaheed of 1984 Saka. Following this first Jakara, each and every Singh raised their heads for 5 Jakaras and it felt like a response came from above every time. Soon after, Singhs focused on a way to bring back the Shaheed Singh and make sure no one else from Gurdwara Baba Attal Jee was left behind. Bhai Manmohan Singh Fauji brought back Shaheed Bhai Mehnga Singh Jee’s body on his back all the way down the steps of tall Gurdwara Baba Attal Jee. They arrived back at Nanak Niwas Saraa and notice was sent for Shaheed Bhai Sahibs family. Bhai Sahibs body was layed to rest on the roof of Nanak Niwas and we saw the bullet wound in his head and on his nose. We surrounded the body with bricks of Ice to keep it cool and Shaheed Bhai Sahib seemed to keep his Swaas Swaas Simran going for quite some time even though his body was null. Jathedar Sukhdev Singh jee asked Singhs and Bibian to keep Sukhmani Sahib and Simran going all around Shaheed Bhai Sahibs body, this continued all night long. None of the Sathis of Bhai Sahib had sadness in their face for they had done Ardaas to Akal Purakh Maharaj for the same Shaheedi every day themselves. Some years before, near Kartarpur Sahib at Bhai Gurdita Jee’s Asthaan, where people go beg for worldly gifts, Bhai Mehnga Singh Jee had done an Ardas for Shaheedi. That Bhai Mehnga Singh Babbar who just one day before did not want to leave his volleyball game, one June 1st left his brothers in arms and attained a win like no-other, Bhai Sahib became the first Shaheed of 1984 Ghallughaara. Next post June 1984 :- OH DELHI, HOW CAN WE FORGET ? ?